Plesk Migrator Extention should be installed on the Destination Plesk server (also referenced as Target in some documentation). Plesk Panel should be accessible locally on the Destination server through localhost (127.0.0.1). Plesk Migrator requires built-in administrator credentials for the Windows Source server and root user credentials for the Linux one. At least 2GB of the free disk space is required on the Source server. Each domain from Source Plesk below 10x version (where the new business model had been introduced for the first time) will get a new subscription on the Destination server. ASP.NET 1.1 is not supported on the Destination server. All server-wide settings set up in Tools & Settings menu will not be transferred. PHP settings on the domain level are migrated only in case if PHP handler from source persists on the destination server. Additional PHP directives of the domain are not migrated. Additional Apache/Nginx directives get migrated from Plesk 12.x or newer. Plesk Migrator does not transfer Apache modules and shows a corresponding warning. The most popular warning is regarding mod_perl and mod_python. Custom configuration (e.g. permissions set not via Plesk, web server configuration changes done not via Plesk) are not transferred. Client login should not exceed 16 symbols. Empty passwords on the Source server cause the issues for migration. Database assimilation is possible and works perfectly, but on Destination Plesk, it is required to specify options for remote database server manually (in service plan after migration) as well as switching to the remote database servers. Migration of domains with long names could fail. Migration from Plesk on FreeBSD does not work. Migration from Parallels Small Business Panel does not work. Database mapping is not implemented yet. In case if databases are located on several MS SQL databases, they will be migrated to the default one on the target server. Reseller and customer accounts that do not have any domains are not transferred. Custom webmail configurations like personal folders, address books and so on are not transferred. Custom templates are not migrated. This is also valid when switching between different PHP versions (eg. atomic-php56 to plesk-php56). @Stéphan, thank you for the additional information, I'll double check that with developers and update an article with results. I think points 10,11,12,13 are easy to implement. 15 and 18 may be handled with some sort of renaming feature, like you already do for databases with conflicting names. About point 11, these settings may be migrated if PHP major and minor version match (for example having PHP 5.3.19 on target server and PHP 5.3.21 on destination server). As for events, they are supposed to be migrated since 2.9.2 version of Plesk Migrator which was released on 07 June, 2017. Refer to Plesk Change Log. As for user-specific permissions and event scheduler status, can you please provide more details? Do you mean that you set some custom permissions for db user through Plesk interface on source server and they were transferred incorrectly? @Bulat, I retried the migration multiple timesbut the following objects weren't transferred: routines, functions, AFTER triggers. Plesk is version 17.5.3 Update #25 on both servers. Plesk Migrator is version 2.11.4-0 on both servers. O.S. is CentOS 6.7 with MySQL 5.6 on target server, Ubuntu 16.04.1 LTS with MySQL 5.7 on destination server. > Do you mean that you set some custom permissions for db user through Plesk interface on source server and they were transferred incorrectly? Yes, exactly. For user-specific permissions I mean GRANTs you can set from Tools & Settings > Database Servers > phpMyAdmin > User accounts (screenshots: https://snag.gy/5j4OFb.jpg - https://snag.gy/KXseUE.jpg). They weren't transferred at all. 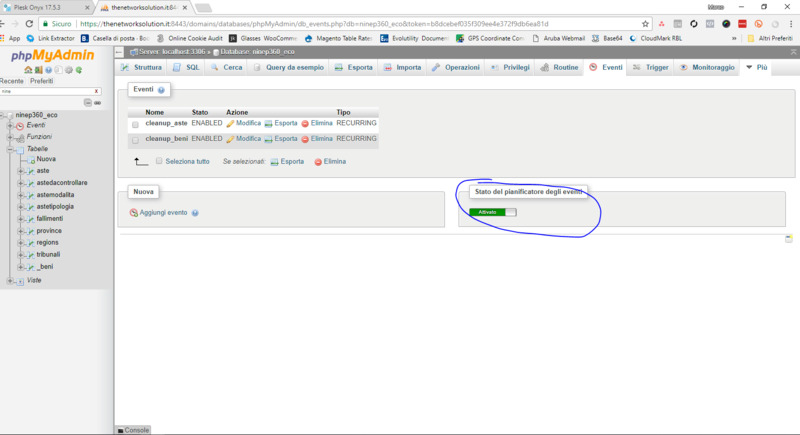 As for Event Scheduler status I mean the global option you can enable from Tools & Settings > Database Servers > phpMyAdmin > (select a database) > Events (screenshot: https://snag.gy/gkS1ba.jpg). As you know, event scheduler should be enabled when you want to run events, so it's advisable to transfer the value of that setting. Actually, it wasn't transferred. > I think points 10,11,12,13 are easy to implement. 15 and 18 may be handled with some sort of renaming feature, like you already do for databases with conflicting names. > About point 11, these settings may be migrated if PHP major and minor version match (for example having PHP 5.3.19 on target server and PHP 5.3.21 on destination server). As for these statements, it would be great if you provide your suggestions how Plesk migrator extension can be improved with your vision how it can be implemented at Plesk Uservoice. The top-ranked suggestions are likely to be included in future product updates. 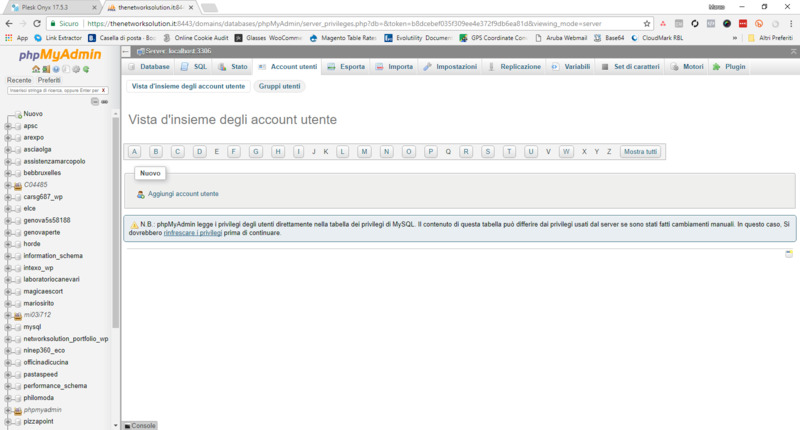 @Marco, I've just checked that in test environment and indeed they were not transferred. I am going to report it to developers. Our development team has investigated the issue and confirmed that it was caused by a product defect. A bug has been created: PMT-4065: Plesk Migrator does not transfer MySQL events, global user privileges, stored routines, event scheduler status. Thank you for bringing this to our attention! Thank you for bringing our attention. This is predicted behavior and it will be fixed in scope of the same bug. I didn't expect transferring a plesk data to a new server would be that time consuming! I thought it would be less tedious. On some other control panel this process could be done on one shot. 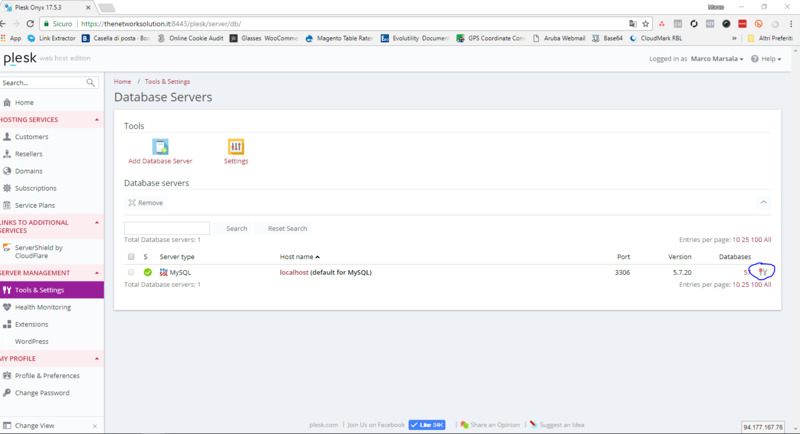 This migration tool is good but when we need to migrate some domains or a domain, but not good when we want to migrate the whole Plesk data to a new server, what if a company has 10 servers and need to migrate to a better hardware, will they have to keep on fixing issues and installing the required modules on the new Plesk servers to migrate? I just need a replica Plesk server because I am migrating to a better hardware server, why Plesk can't migrate every thing and configure every thing the way the original server is configured? Thank you for sharing your thoughts about Plesk Migrator. > what if a company has 10 servers and need to migrate to a better hardware, will they have to keep on fixing issues and installing the required modules on the new Plesk servers to migrate? Yes, you are correct, it will be required to have required components installed on a target server. > I just need a replica Plesk server because I am migrating to a better hardware server, why Plesk can't migrate every thing and configure every thing the way the original server is configured? Plesk Development Team is constantly working on improving functionality and adding new features. However, for now, there are limitations described in the article. I hope the extension will be able to migrate every thing in the future as you know anybody may have to migrate his Plesk server to a better one as I did recently, for a better hardware resources server. I just noticed something, after resync mails form original server to the new server I got errors about missing email addresses on the new server, this happens twice after I resync from migration extension, the old server is Centos 6 with Onyx and the new server is Centos 7 with Onyx, this issue just solved by only running this after re-syncing mail! Another issue I am still searching for a solution online which is, on the new server after migrating all domains, yes all are working fine! but Wordpress toolkit not showing all wordpress installations on its interface, only shows 3 wordpress instances from about 65 instances of wordpress. use scan for wordpress button didn't solve the issue, also there is no error I get back from scanning. 1. There is a possibility that such issue is caused by inconsistency in mail database. You have applied the correct solution. 2. It is expected that WordPress instances are not displayed in WordPressToolkit after migration. Scan process should be used to detect such installations. However, in your case, this does not work. What are the versions of Plesk and WordPress instances, which are not detected? Nothing worked BUT reinstalling Wordpress tool kit extension, afterwards scanning worked fine! When this article states, "Custom webmail configurations like personal folders, address books and so on are not transferred", does that mean that any user's Horde Webmail address book (for example, from Plesk 11 on CentOS) will not be copied to the new server? I can't imagine this is the case. Thank you for the feedback. Indeed, address books are not transferred.